This was another one of the cards we did at my last techniques class. It is the Drunken Chalk technique. This picture doesn't really do this card justice but I wanted to post it anyway. The dark gold you see here is really the Gold metallic pen which is very nice when shown in light versus in this picture. We also used Crystal Effects on the "C" in Cherish giving it a nice glossy look, again not really apparent in this sample. Sorry about that. Anyway, we still had fun making this card. Color Box (green, blue, mustard-like wedges). Retired item. Take a blue wedge from the Color Box and stamp randomly on the Glossy White cardstock. Take a green wedge and do the same. Take a mustard wedge (if desired) and do the same. Spray Glossy White cardstock with the rubbing alcohol until it starts to run. Allow cardstock to dry completely. Sponge or dab Gold Metallic ink where desired on Gloss paper. Then spray with rubbing alcohol again. Stamp Cherish in Baja Breeze. Using a Gold Metallic pen, trace around some of the swirls. Using Crystal Effects, trace/cover over the "C" in Cherish (only the large "C"). Set aside to let dry. When all the pieces are try, assemble the card. Use the Ticket Corner Punch on the Glossy White and Shimmery Gold. Adhere. 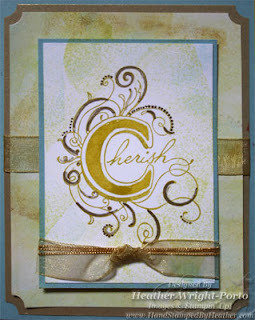 Wrap sheer gold ribbon around and adhere layers to card front. For the front panel, focal point, you can use the Ticket Corner Punch again or not (I didn't but it would look nice). Wrap gold cord several times around these pieces. Tie a knot with the sheer gold ribbon in the center of the gold cord. Trim edges to be aligned with the front panel. Adhere panel to card front with dimensionals. This is just so elegant and GORGEOUS!! !